My work now is best disecribe as a mix of biology, optical analysis, and chemistry. And I had to thank a lot of people for providing the opportunity in this demanding task. To think about neural network, it is more complicated than any internet routing algortihm. In fact, the routing mechanism derived teminologies from biological network of neurons, vice versa. (c) Anton Rahmadi. 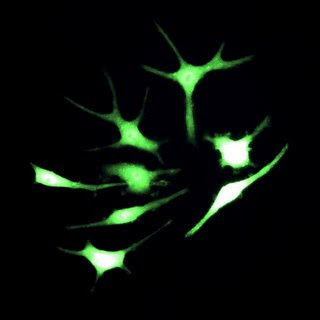 title: neurite extensions as communication means of neurons. Image was recorded with optical maginification of 400x and fluorescent green emission/excitation. Here are some resemblances: (1) burst signal (2) delay input and synchronization (3) spike. Scientists are now developing algorithm to understand and mimick neuronal signal. Djiksra algorithm, a.k.a shortest path routing , being employed as an approach to biological neuron communication, other advanced mechanisms are also utilized. It is quite fortunate that I had an opportunity to work on a patented and very specialized software for cellular image analysis. The software was developed quite a long time ago and now being improved to provide a real time imaging analysis. 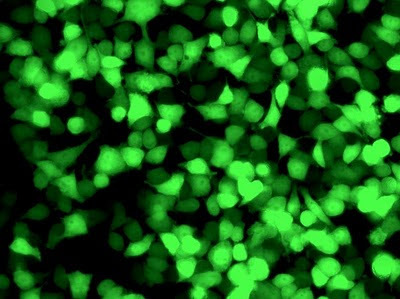 From this picture, the software should be able to distinct each cell (represents by fluorescent green dots), hence producing a ratio based on cell size, intensity, and volume. Tweaking the software to meet my particular objective is not an easy task. A bit of mathematics and statistical background are needed, not only understanding the principle of image analysis. I had to stop here, any advancement on this particular topic will be discussed later on.